For weeks we have been embroiled in a war on the water. A battle against a foe that was relentless in its path. The enemy had been victorious over previous tactical plans. Meager attempts to stall its advance all met with great defeat. 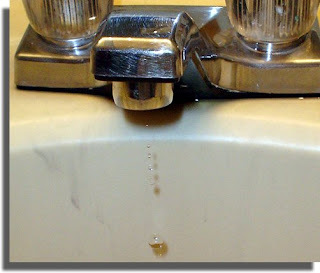 The Great Battle Of The Drippy Bathroom Faucet. I had had enough of the feeble salvos to repair the old, cheap and frankly rather ugly spout. Out came the big guns. And my credit card. I bit the bullet and requisitoned a brand spankin' fancy new one. - I shovelled out the crap from under the cabinet. 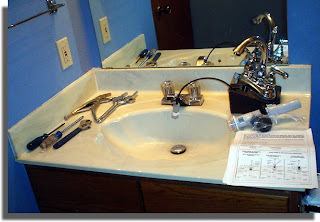 - I cleared off the sink counter. - I set out the battle plans (Instruction Manual) and laid out the weapons (tools). - I then enlisted the Draft and pried hubby away from the television. - and thoroughly exhausted troops. And the battlefield never looked better. This is why I usually bit the bullet and call a plumber...I would just as soon pull out a Ferrari engine and work on it, that do household plumbing. Ah, a happy ending. Plumbing is some nasty work to take on. I avoid it like I avoid the dentist. Okay....that new faucet is bootimus! NICE!! Love the first picture. You can even see the offending drip dripping!! Good shot! Nice faucet! How many pics did you take to get the drip. I liked that one. Lotus07: Yeah, it was messy and gross, but at least now we know a whole lot more about plumbing! Vegas Princess: It's American Standard actually... 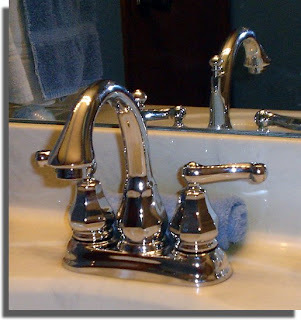 I love the high faucets; much more practical! Day Dreamer: Thanks! That was the only pic I took of the old faucet, and was surprised to see the drip when I uploaded it to my computer... that wasn't intentional! Ed: Thanks! One photo was all it took... which just proves all the water that was literally constantly going down the drain. What a waste. Congratulations! I'm impressed! I've tried to install two faucets, and ended up calling a plumber friend for both. Oh I *L*O*V*E* plumbing stories!!!!!!!! Very pretty new faucet & glad it only took 6 hours!!!!!! I think I've had some that lasted longer...though six hours is a pretty good run! Ah...congrats for a job well done. Now, please come down here and fix my sink (tree roots in the drain).